Taken over 50 years ago, this view of Fleetwood’s Marine Gardens will bring back memories for many local folk. As a picture postcard this scene was sent by holidaymakers all over the country. Central to its appeal are the wonderful flower beds and well kept garden. Notice the decorative lights – and the railings around the Mount. 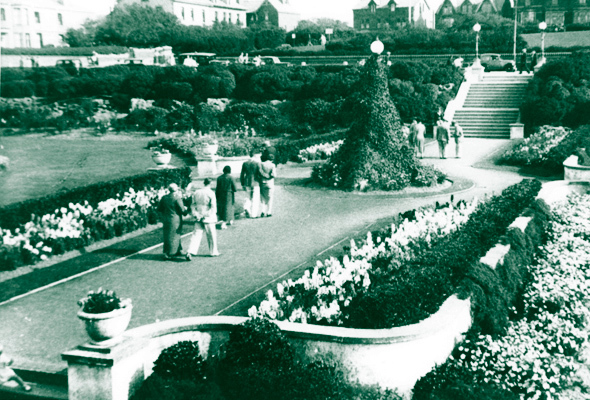 The sunken rose garden to the left was always a favourite spot with both visitors and locals. It provided a quiet sheltered spot and its transformation to a car park caused a row in the port as locals fought to retain this little corner of Fleetwood. Today, apart from the central path and steps, nothing is left of the lawns and flowerbeds. The area serves as a car park for the swim and leisure centre. First published in Life in Fleetwood issue 38, autumn 1995.